The collection that follows is one of our favorites. The uniqueness and unparalleled beauty of this line draws attention from all angles. We are proud to announce that all of these products are completely handmade. This process ensures that what you buy is constructed without variation in quality. It is important to note that this process means that no two products are ever identical and light variations will occur. We believe that this lends to the unique nature of each and every product. Our seagrass furniture is tightly woven, resulting in a premium finish and smooth feel. Our seagrass furniture is not prickly like wicker furniture. We can even produce custom finishes with quantities of 10 or more. The Water Hyacinth, AKA seagrass furniture, is a prolific floating plant characterized by fragrant lavender flowers and shiny green leaves, and calls the myriad of inland waterways throughout Thailand "home." 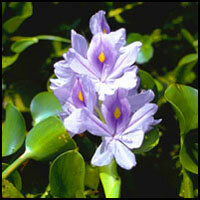 This plant once plagued and congested shipping waterways. With the help of designers it is now converted into fine carpets and furniture. It is a natural product that requires particular attention when cleaning. For spills such as food and mud use a soft nylon brush to remove debris. Use a sponge or a wet cloth to dilute and remove the soiled area. Seagrass furniture won't easily stain and dries to its original color in hours. Be sure to leave the damp area exposed to the air, as dampness could lead to the formation of mold. 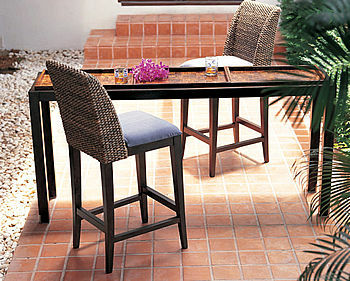 Seagrass furniture is a natural product that requires a dry climate. It is suitable for use indoors or on a covered patio, but cannot be left outside with direct exposure to the elements such as rain, sleet or snow. All cushions are removable and should be professionally dry-cleaned. This attractive seagrass furniture set is composed of finely braided sea grass over a rubberwood base frame. Note the detail of the hand-woven areas, as well as the luxurious cushions. All cushion sets are sold separately. Each piece is available with either standard or deluxe cushions. The deluxe cushions have a choice of down/feather cushions and premium foams. (Please contact us to discuss your preferences, if you're interested in deluxe cushions.) You also may choose from cotton fabric covers, or you can even send us your own fabric. Your fabric color choices are: Black, Burgundy, Navy Blue, or Dark Gray Twill. If you choose your own fabric, you will receive instructions upon checking out on how to send us your material. The Palm Coffee Table complements the La Cantina set with its solid construction and elegant inlay. Its contrasting dark rubberwood frame and palm inlay adds a unique touch, which makes it so beautiful. The Palmwood Credenza has the attractive combination of a rubberwood frame paired with palmwood trays. This unique table is well suited to be coupled with the La Cantina Bar Stool. The La Cantina Bar Stool features the same quality craftsmanship and attention-grabbing sea grass beauty of the La Cantina line, now in bar stool height! You must choose our cushions, or add your own, to finish this bar stool: pick a color for the seat cushion cover, or send us your own fabric. If you choose your own fabric, you will receive instructions upon checking out on how to send us your material. 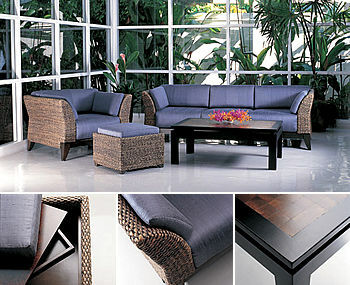 The Tiger Lounge 3-Piece Sectional exhibits high quality, hand-woven sea grass accented by stainless steel legs. This set won't "overcrowd" your room! Note the detail of the hand-woven areas, as well as the luxurious cushions. Each piece is available with either standard or deluxe cushions, and you also may choose from several fabric covers, or even send us your own fabric. The deluxe cushions have a choice of down/feather cushions and premium foams. (For deluxe cushions, please contact us to discuss your preferences.) If you choose your own fabric, you will receive instructions upon checking out on how to send us your material. whether set together or separately. 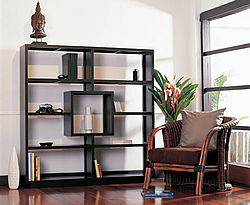 The Library shelf will captivate your senses with its unique design and its solid rubberwood construction. 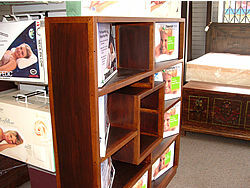 Available in either a flat black stain finish, or ginger stain finish. They measure 59" Wide x 11.75" Deep x 61" High. in our San Francisco show room.